Our bodies need vitamins and minerals in order to perform a variety of vital functions—from utilizing hormones and neurotransmitters to improving immune function and eliminating toxins. Yet often our nutritional stores are depleted from poor diet, stress, chronic disease, vigorous exercise, medications, and simply the demands of an aging body. Absorption of nutrients often decreases with age due to increased incidence of gastritis, low hydrochloric acid secretion in the stomach, and disbiosis (abnormal gut flora). 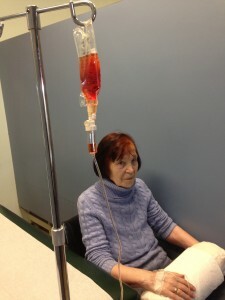 Patient Receiving Intravenous Vitamins at Vinci Health Center. Intravenous infusions of vitamins and minerals provide an excellent way to deliver required nutrients to the tissues in a highly bio-available form. In my practice, I use intravenous infusions to treat a range of disorders including migraine headaches, chronic fatigue, fibromyalgia, stress, insulin resistance, diabetes, high blood pressure, alcohol withdrawal, and acute viral illness or frequent colds. I also use them to support weight loss programs. I have found that intravenous vitamin infusions in the form of a Meyers’ solution are especially helpful in the case of migraines. A Meyers’ cocktail is a combination of B-complex Vitamins (B5, B6, and B12), Vitamin C, Magnesium, and Calcium Gluconate. Sometimes patients report relief in minutes. Depending on the condition being treated, most patients require a vitamin infusion once or twice a week for a designated period, while some patients report significant improvement after the first vitamin infusion.